On the road again – sort of. 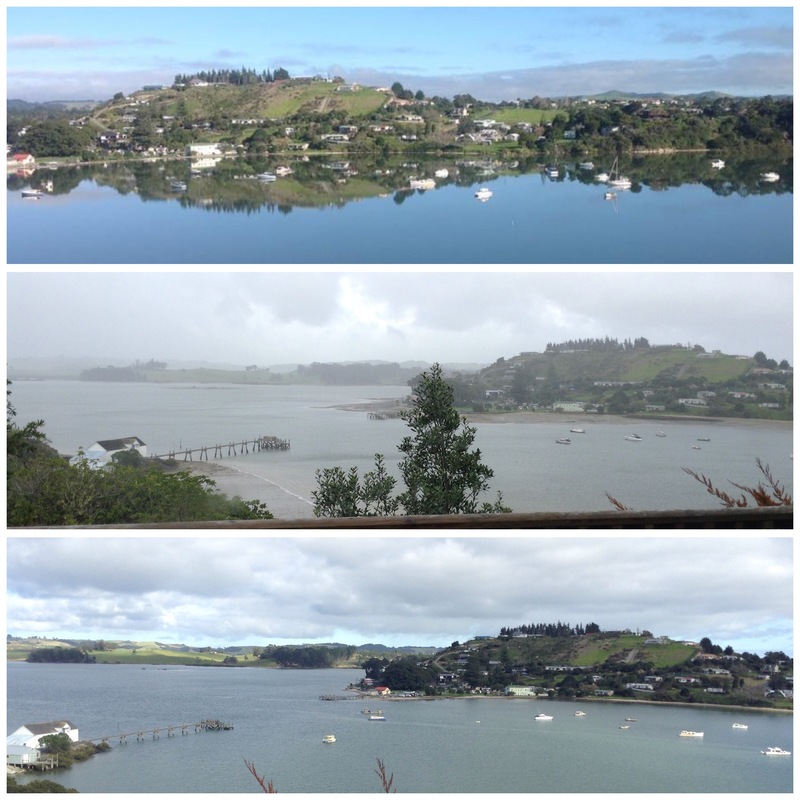 We’re back on the road after finishing our housesitting stint at Jacky & Chris’ in Whakapirau. 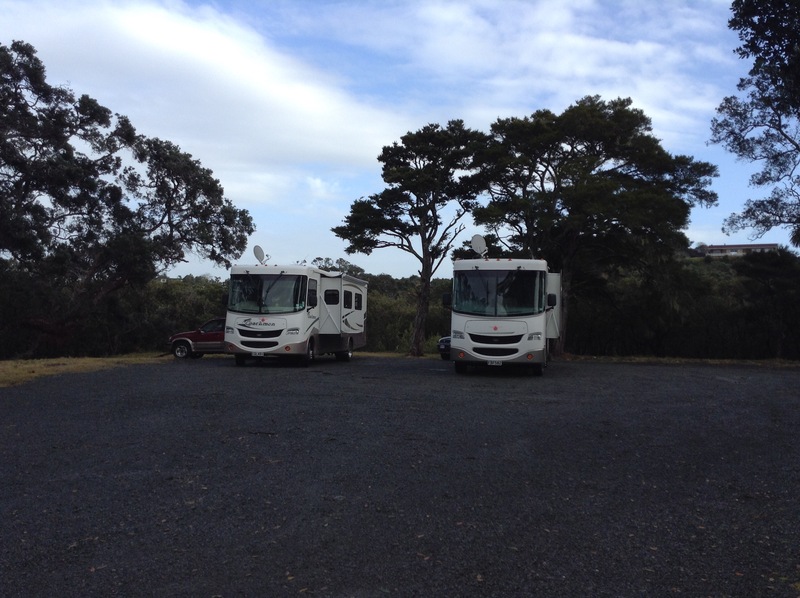 Although we haven’t really hit the open road as yet, as we had the van parked up at Uretiti DoC camp whilst we were away from it, we then moved the van from its storage position to a parking site within the camp which is a move of around 500metres. We stayed with Jacky for a couple of days after she returned from her travels and caught up with all their news and gave us a chance to finish off a few bits and pieces. However, we were pleased to be back in our home again although we did note that our TV looked awfully small compared with the very large screen we had become accustomed to and our shower also did not quite measure up in terms of water pressure and volume of water, but these are things we can look forward to next time we housesit. We quickly settled back in to van life at Uretiti, Pat & Sue were also there as well as another couple fellow full timers we have come to know over our travels. The weather hasn’t been the best, with lots of wind and rain but I guess we are to expect that in the winter time. After a couple of days Helen & Don joined us at Uretiti in their motorhome and over the next few days there was lots of talk, shared meals and laughter. Jacky & Chris visited one afternoon, and it was not long before we had arranged for the six of us (Roy & I, Pat & Sue and Helen & Don) to go out to Whakapirau for a meal and to all stay the night and for Don & Roy to reduce the sheep numbers by one! As a retired sheep farmer Don is quite au fait with the protocols and methods required, and Roy also has done this a few times over the years as well as portioning off the final product. The deed was done quickly and efficiently and for those of us who choose to know as little as possible about the whole procedure, it was done with respect for us as well as respect for the animal. Enough said. Time for a afternoon drinks before a local, Grant, joined us for dinner. The afternoon quickly progressed into a great evening of good food washed down with a few drinks before developing into an evening of talk, tales, much laughter and lots of singing! There is a video or two of the evenings melodious antics which will not be available for public viewing, you know what they say, what goes on tour…stays on tour. Let’s just say it was a great night. Pat desperately trying to get his hand on the coveted Elvis Lamp! Helen & Don left us to begin their return journey south whilst the rest of us head back to Uretiti to our vans, where it was a quick tidy and pack up before deciding on where to next. We have been quite busy with visitors whilst here at Whakapirau. The first weekend, Colin & Edwina came to stay, this was the weekend of the final All Blacks game against Wales which of course we all watched together. Ed had brought dinner with her including a Love Cake. I had not heard of a Love Cake until just the previous day when I had listened to a story on National Radio which involved the making of a Love Cake. It was a delightful story by a new migrant to our shores, giving their perspective of life in a new country and trying to fit in. This lovely story was read by a good friend of ours Marguerite. There was a week of the stories which we can highly recommend listening to on National Radio, this particular story was called Baked Slowly can be heard here. Meanwhile, we settled down to watch the game on tele…. 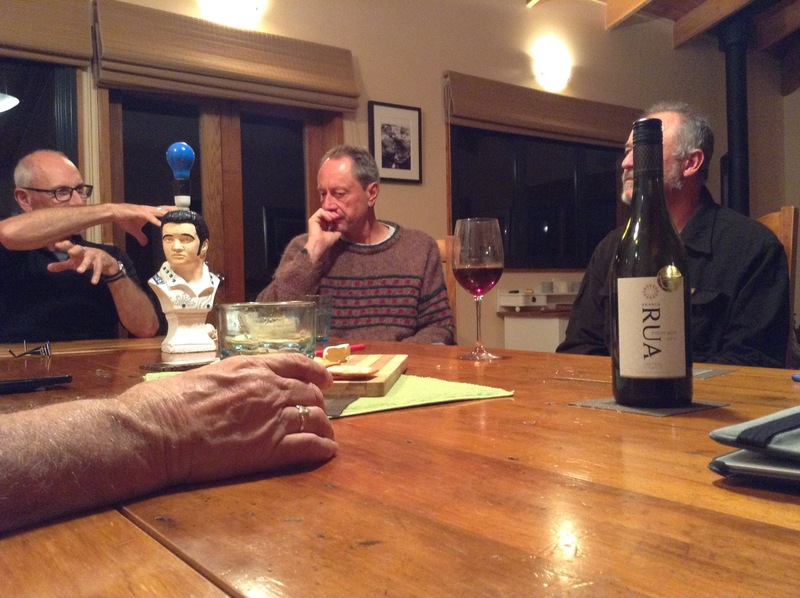 Roy, Colin, Edwina & Bernice with the much coveted Elvis Lamp sporting his updated livery in the foreground. 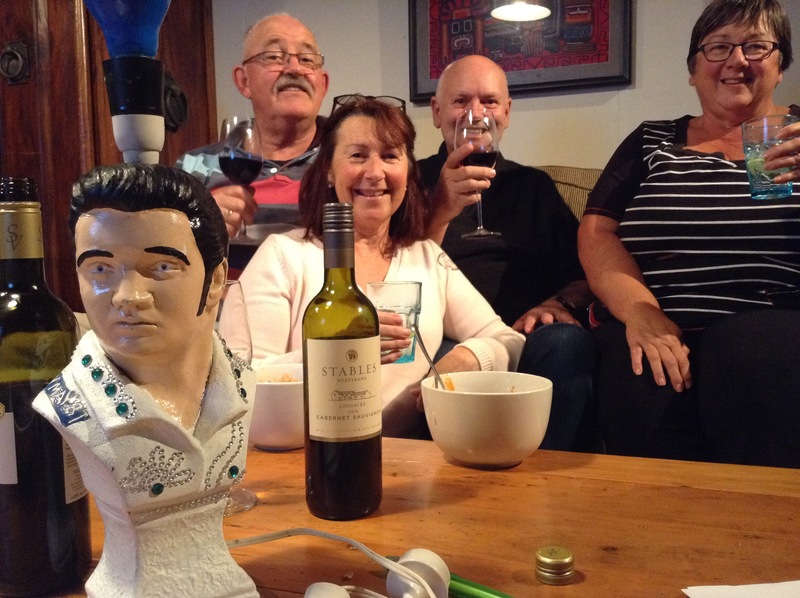 The significance of the Elvis Lamp and its relevance is known only to a privileged few and usually requires the imbibing of large quantities of fermented grape or grain, and has been awarded to the lucky recipient since the late 1980’s. I am pleased to say we have been fortunate enough NOT to have it adorn our mantlepiece! A great weekend was had catching up with Colin & Ed before they returned to city life. Just a couple of days later, Murray & Lynne from Oamaru called to ask where we were as they were exploring the north in their campervan. 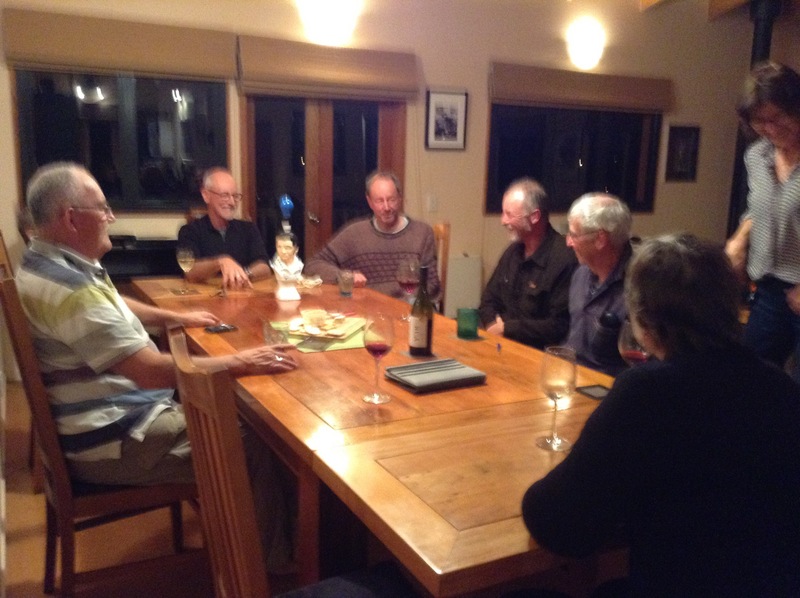 It just so happened that they were in Dargaville heading south so it was a short drive for them to come and stay a night with us so we could catch up on all their news. 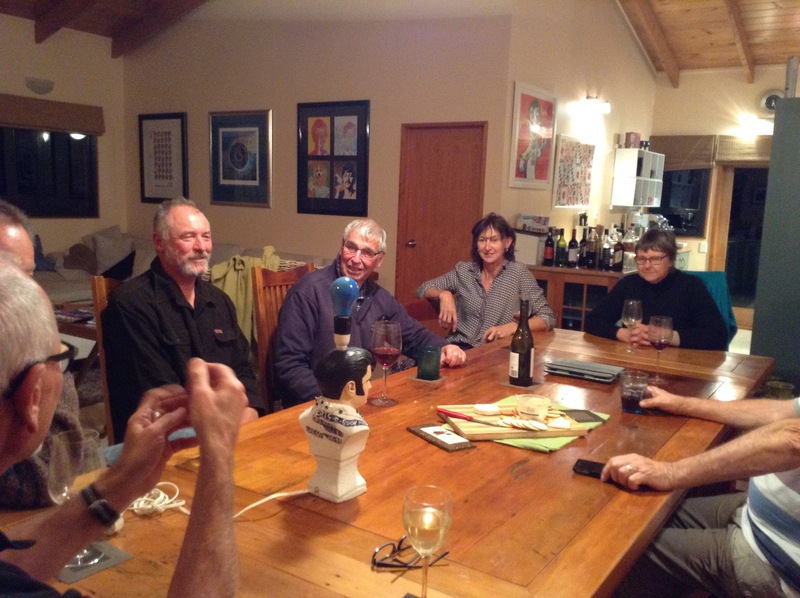 We had our first aid course to attend in Auckland, and on our return friends Helen & Don, also from Oamaru, called to say they were heading north in their campervan so we invited them to come and stay for the weekend. Helen & Don have a hazelnut orchard and we have done housesitting for them in the past as well which you can read about here and here. At the same time, fellow full time motorhomer Jim also came to stay for the weekend, Jim’s wife Judy recently died. The weekend passed very quickly with a bit of fishing done by the blokes off the wharf, some netball watching, and generally catching up with lots of talking. NB all three blokes wear hearing aids, each to varying success so you can imagine the volume at times! Monday morning and Jim headed back to his bus, and later in the day Helen & Don coninued on their travels north. We hope to meet up with Helen & Don once we are back in our van somewhere in the north. Pat & Sue were the next to arrive on Tuesday. 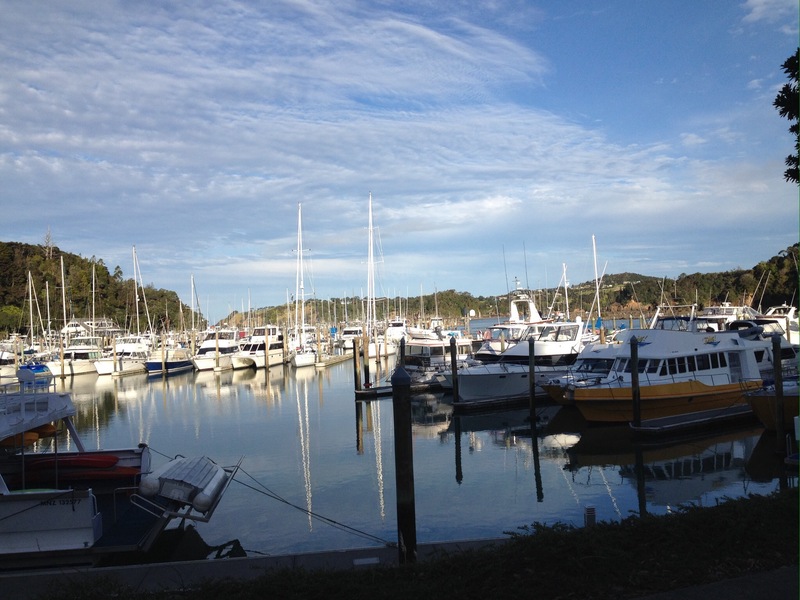 Regular readers will know that we travel together quite regularly and as well, they took on our Housesitting duties here at Whakapirau last year when we had a break in Melbourne. You can catch up on that reading here. Whilst here, we got Pat to do a bit of a rabbit cull as the rabbits seem to have been active doing what rabbits do best. They left on Wednesday to return to their van, and it was only the next day that we went over to our van at Uretiti to do a few chores and catch up with them again. Friday night a local, Grant, came to have Friday night drinks with us. He tells us it’s a regular event with Jacky & Chris so who were we to argue? Besides, it’s great to meet new people and learn a bit more of local life. Saturday Steve & Les came to stay bringing with them their three young grandsons Ben, Asher and Finn for a weekend of fun on the farm. The boys loved getting out and about collecting eggs, helping to move sheep, fish off the wharf, and get muddy! 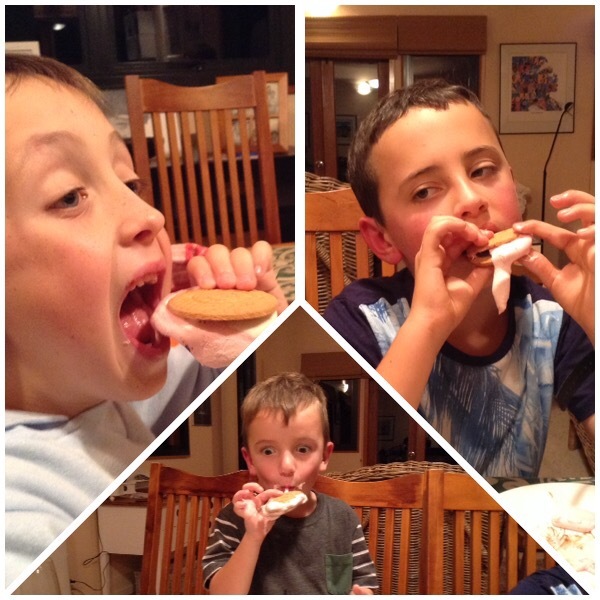 Teaching the kids how to eat s’mores. With all these visitors anyone would think that we had run a Lodge or something at some point in our lives! 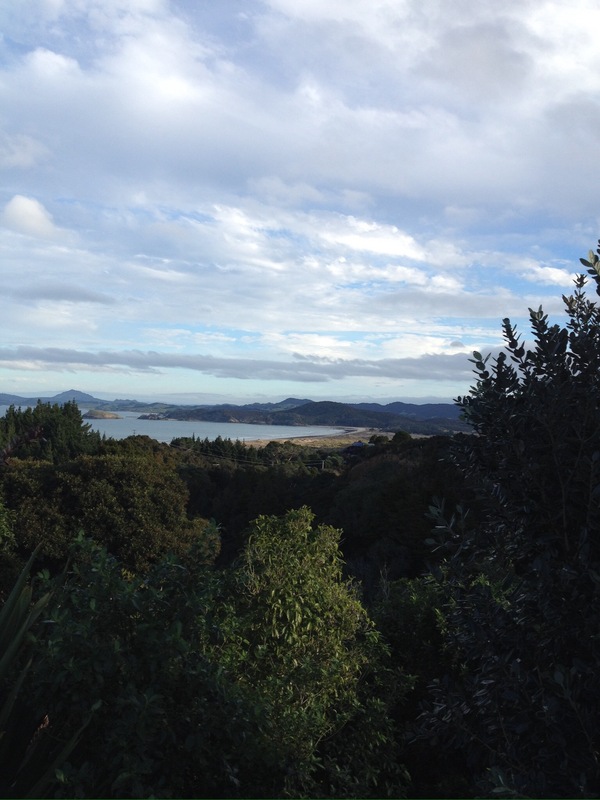 Same view, different days, looking across to Pahi. One day the reflections are glassy and the sun is out, another day it’s grey and moody. Then a squall of showers will pass through changing the view and dampening any outdoor activity. Then of course there are the tidal changes which dramatically change the view. We have had an awful lot of fog too, some days it lingers for most of the morning, some days it clears quite quickly, and another it will lift momentarily before decending to cloak us in a grey blanket. 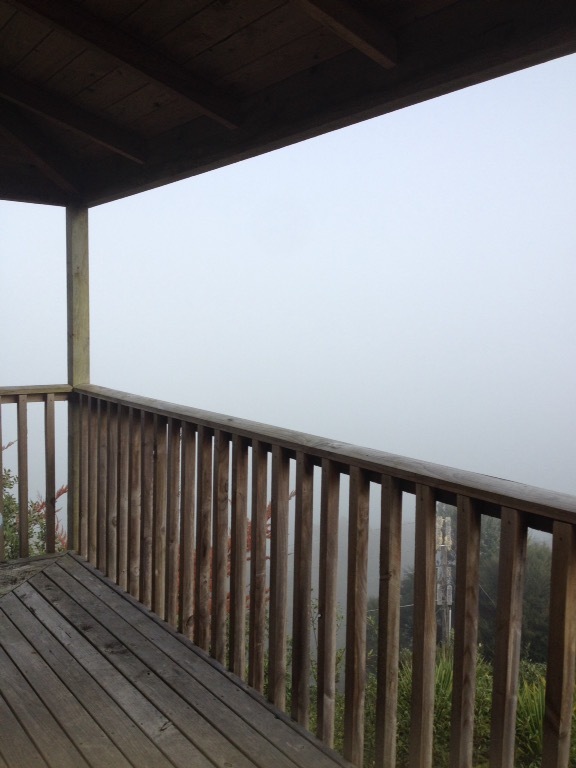 Oops where did the view go? 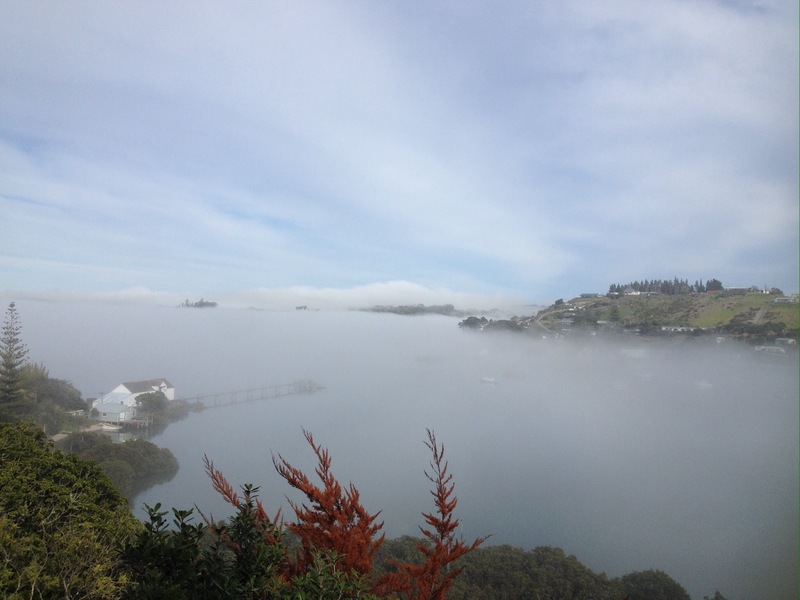 Layers of fog coming and going. And of course there has been the rain. The rain on this particular day was coming in horizontally, bouncing off the roof in large misty sheets leaving behind muddy puddles and small riverlets running down the driveway. 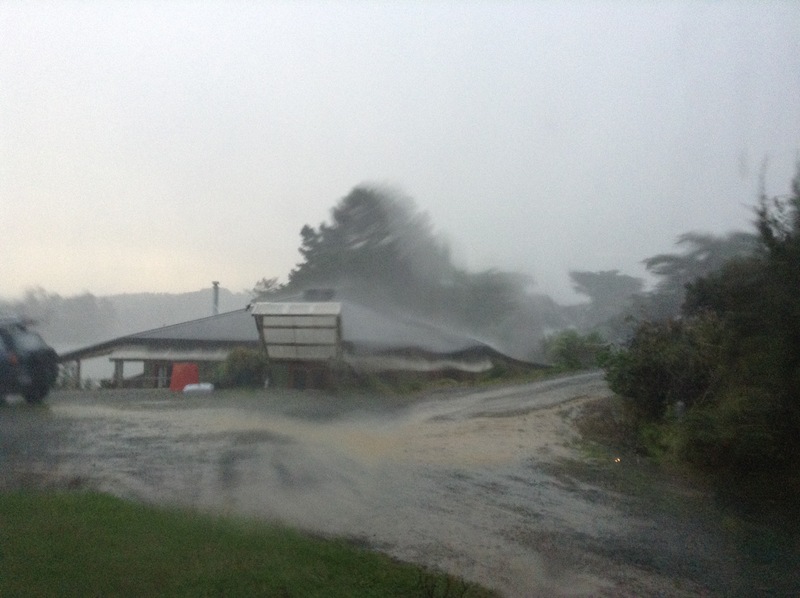 Then there was the spectacular thunder and lightening storms, which put the power out for short periods of time, but shook the house and rattled windows not to mention the nerves. And we did have one frost but nothing like what other parts of the country has experienced and it certainly has not been as cold so far this year as it has in previous years. Perhaps the cold weather is yet to develop.